COMPANY : - Fusion healthcare pvt ltd. 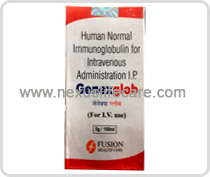 Uses : - Genexglob is used Hepatitis A , Hepatitis B , Bone marrow transplantation. A gammaglobulinemia, severe infections in immunodeficient patients or neonates. Genexglob is now rarely used as prophylaxis, in Hepatitis A or Hepatitis B infections. Genexglob prevents or modify measles attack in Immunocomppromised patients. Primary rubella in pregnant women whereby pregnancy termination is unacceptable. Idiopathic thrombocytopenic purpura, Guillain-Barne syndrome.